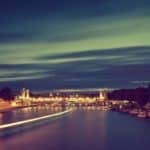 Roaming the 18th arrondissement of Paris is one of the most fulfilling things you’ll do during your time in the city. 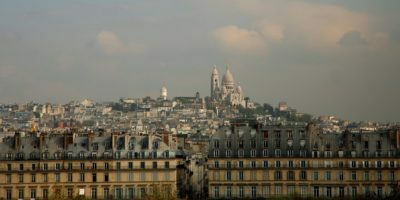 Montmartre is the village on the hill and is comprised mostly of artistic history and bohemian remnants. Taking a day (or more) to head into this part of Paris is absolutely necessary. 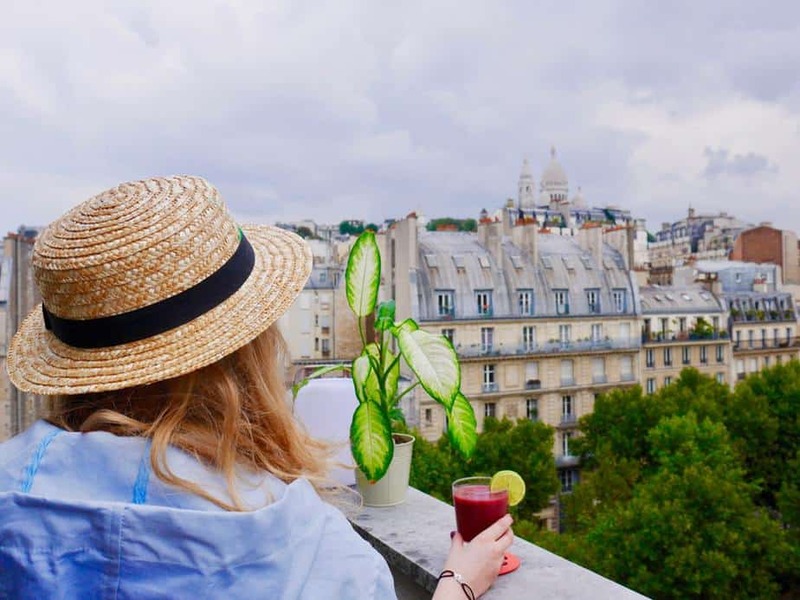 Whether you’d like to shop, eat cheese and wine in cafes or explore an array of different museums, Montmartre is the most charming town in which to do so — it also happens to be filled with beautiful picnic spots! 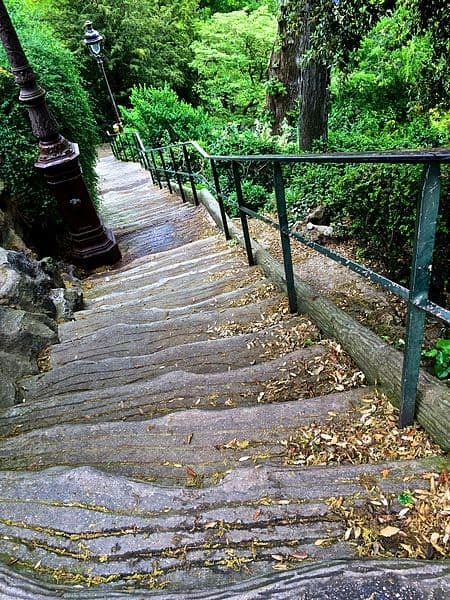 The nature of Montmartre requires one to wander on foot in order to find all of the hidden spots. Unfortunately, the size and layout (the climbing hillside) of the area can make it hard to meander on foot for very long before exhaustion sets in (Read more about Discover walking tours). 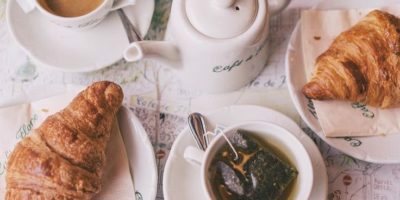 To save you the struggle, I’ve compiled a top 10 list of picnic spots in Montmartre for you to enjoy! 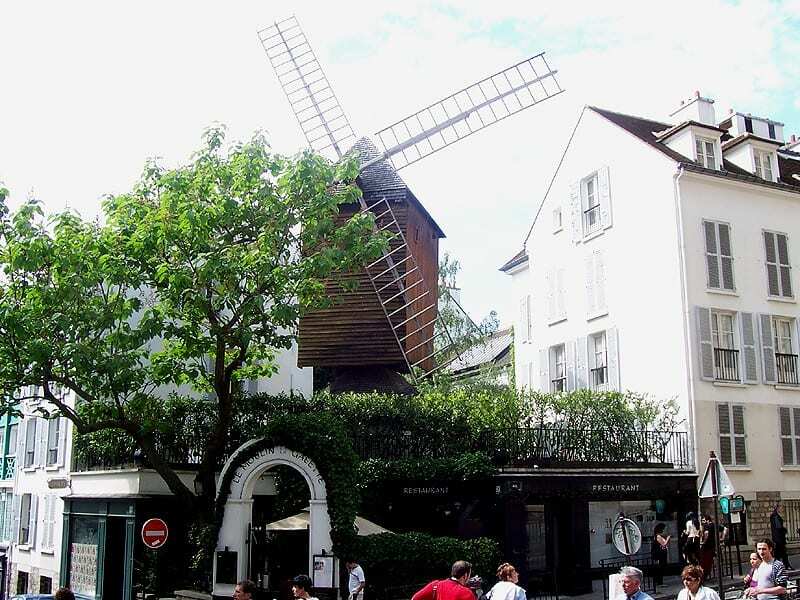 Many years ago, Montmartre village was filled with windmills. Aside from the iconic one atop the Moulin Rouge, there are two of the original Montmartre windmills still standing. Together they are known as the Moulin de la Galette. 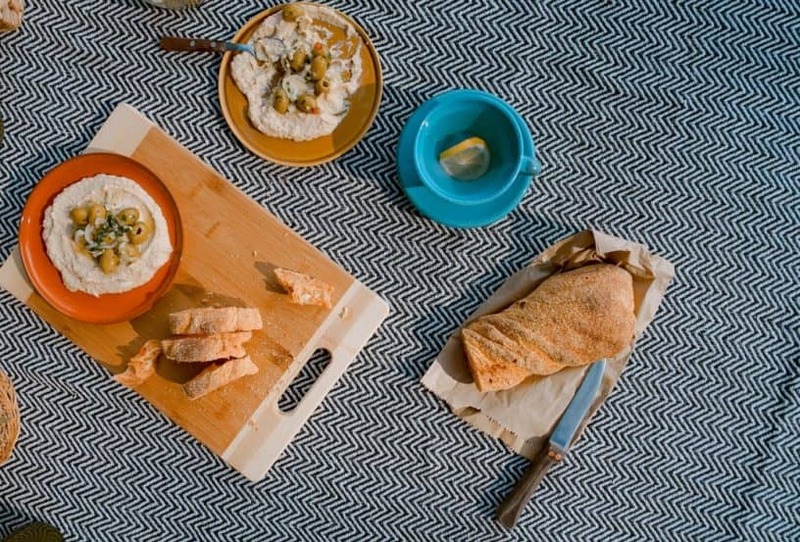 The one that is best by which to picnic is over on Rue Lepic. The windmill itself is currently run as a restaurant, so you won’t actually be picnicking inside the space. When you get to the road you’ll find viewing benches on the curbside where many visitors to Montmartre like to bring a packed lunch that they can enjoy while admiring the structure. This is also an ideal public point if you need to meet with a stranger for the first time. 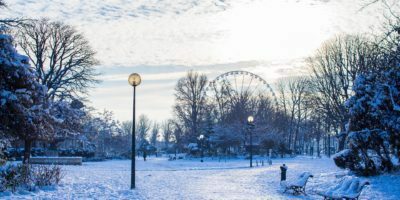 Start your picnic here and then make a walking mission to find the other remaining Windmills of Montmartre not far away. The second of the Moulin de la Galette is over on Rue Girardon. Also not open to the public on the inside but fully viewable from the outside. 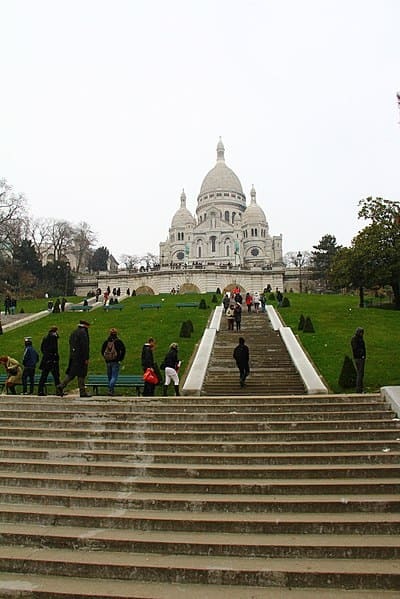 The Sacre Coeur is the monumental church that crowns the top of the Montmartre hill. 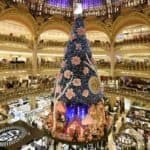 The structure is visible from most parts of Paris, and is one of the most beautiful churches in the world according to public report. Just outside the church there are expansive stairs that file down the hillside. By day these steps are filled with visitors to the church; most trying their hand at getting the perfect angle from which to fit the entire building into their Instagram frame. Since the stairs are so wide spread there is always space on which to laze in front of the church for a few hours. Some visitors bring a picnic along and enjoy their lunch under the shade of the church steeples. If you don’t mind things to get a bit cheesy (and I don’t mean fromage), then this next picnic spot is a great place to take a date. The Wall of Love is a 40 square meter structure that features the phrase “I love you” in over 250 different languages. 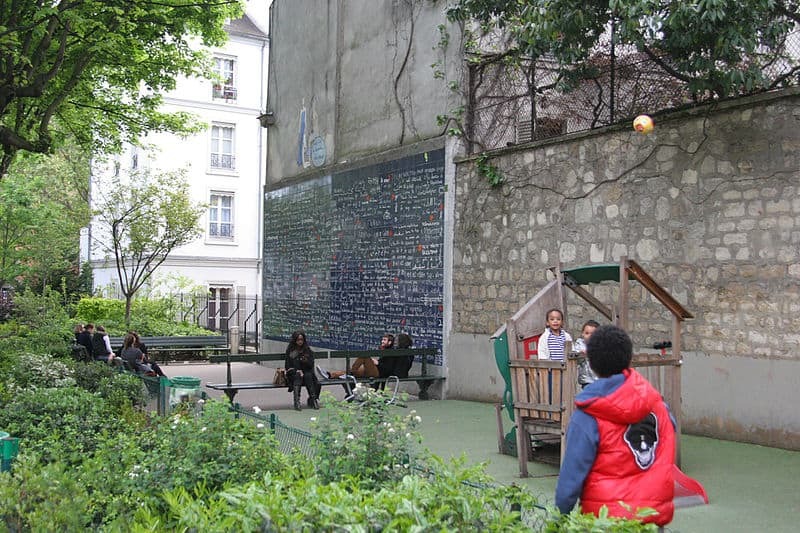 A people’s project, the Wall of Love has become one of the most well known attractions in Montmartre. If you don’t mind the feel of concrete then a picnic on the grounds by the wall is perfectly enjoyable. Bring a blanket along to make things a bit more comfortable. If the floor isn’t your vibe then there are plenty of park benches adjacent to the wall that visitors can make use of while picnicking, or even just sitting. Whenever I come to this landmark I like to spend a few minutes challenging myself to find specific languages on the wall. It’s fun to do with a friend as well — think of it as picnic games. 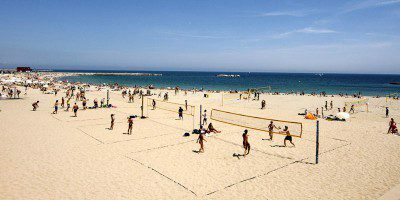 The locals know this spot as Le Mur des Je t’Aime; if you’re having a hard time finding it in the square this is what you need to ask for. Not the most conventional spot for a picnic but when in Paris, why not? 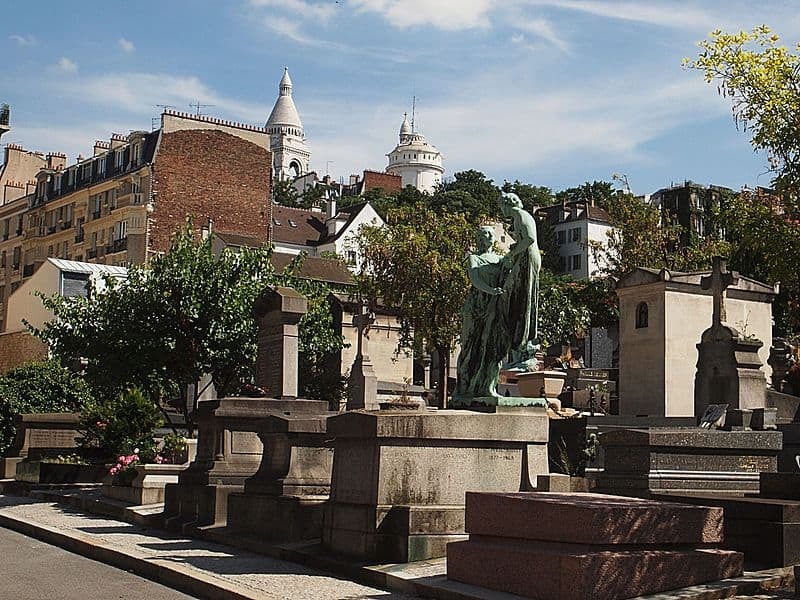 The Montmartre cemetery is a beautiful garden style necropolis. 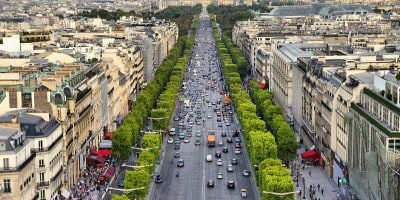 It is the third largest in Paris, after Père Lachaise and Montparnasse. Garden cemeteries are beautiful, unexpected spaces. All through the grave site there are towering trees and blossoming flowers. The greenery grows side by side to the graves and tombs, and the entire place is automatically more enchanting and less creepy. Pack your picnic snacks and a comfortable blanket for the ground and head to the grounds any day of the week before 6pm. The cemetery is predominantly full but every so often there is a gap in the floor where a small picnic can take place. 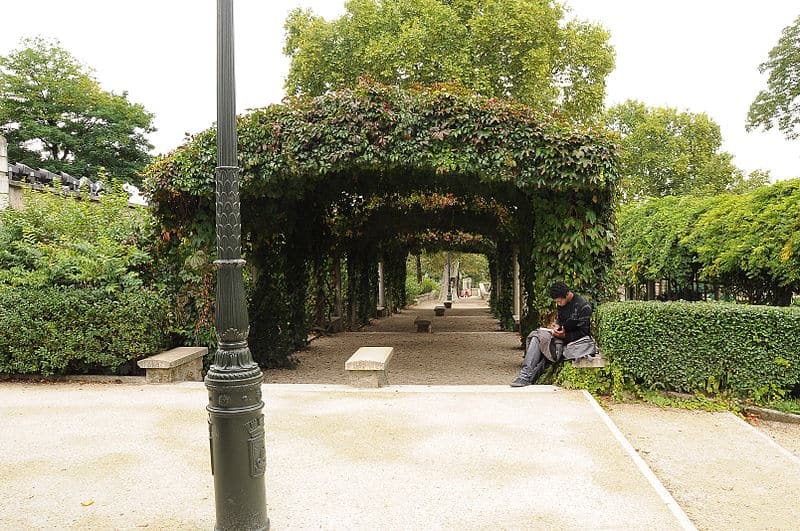 If you’re in search of the kind of picnic that won’t be disturbed by passers by then this is probably the most private place in Montmartre to be. 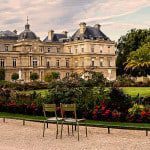 This next picnic spot is generally an overlooked space when it comes to enjoying the Parisian outdoors. 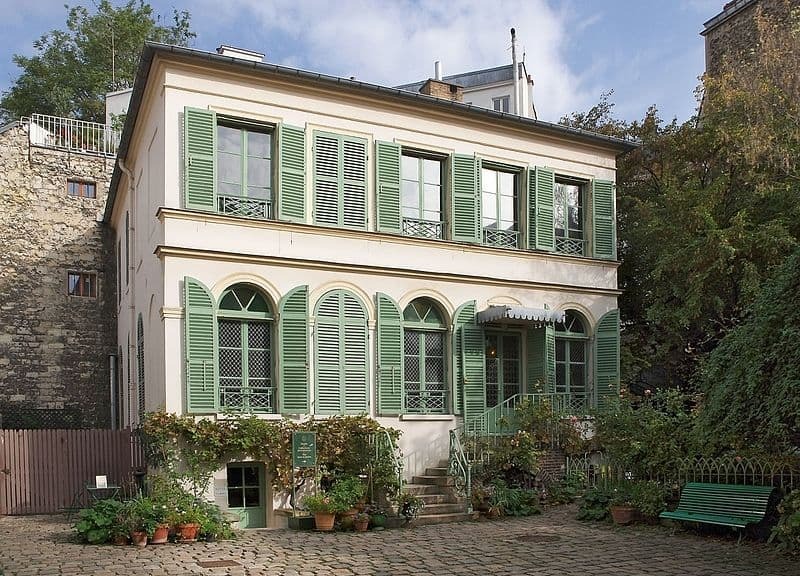 The Musée de la Vie Romantique is a muséum built into two hotel buildings dating back to 1830. In addition to the museum the grounds also feature beautiful gardens and a dated greenhouse. 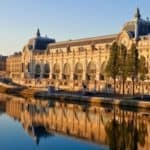 The museum is an ode to the romantic era of Paris. Inside you can experience an eclectic collection of furniture, ornaments and art from the years gone by. The space is exquisite and doesn’t take very long to move through — so just one or two hours to kill would be fine! Afterwards make your way to the courtyard or garden areas and enjoy a picnic under the French sun. The museum is a haven and welcome escape from the bustling Montmartre streets. It gives one a sense of being outside of the city in the countryside; Normandy comes to mind. 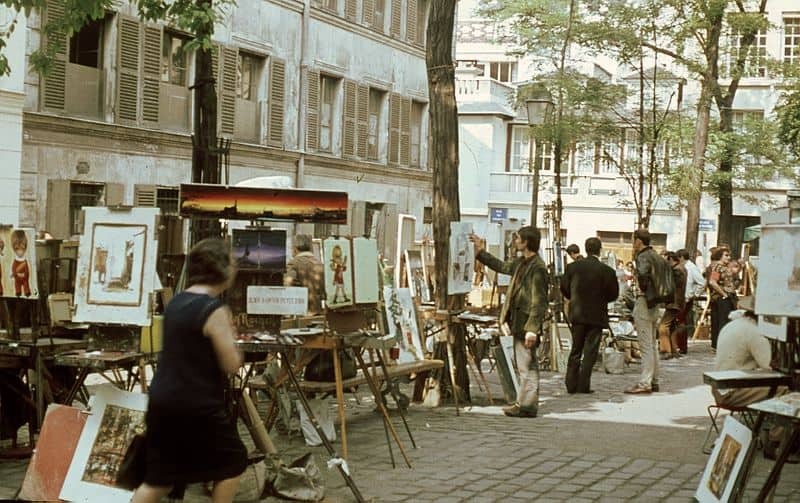 The Place du Tertre is the main square in Montmartre and is widely known around Paris for its unique nature. The square is a vending space for street artists from around the city. There are over one hundred spots available in the plaza that artists can make use of day after day while tourists and potential buyers roam between them. This is where you’ll get a unique caricature drawn of yourself or your children. Or a family portrait to commemorate your time in the city. Once in this Montmartre square you’ll also find ample place to settle down for your picnic. Bring packed foods along with you or simply bring your blanket and leave the food to the many cafes and restaurants in the square vicinity. The 18th century buildings that surrounds the plaza in Montmartre hold vast history of their own. Most free guided walking tours will pass through here to share the tales of the past with their groups. 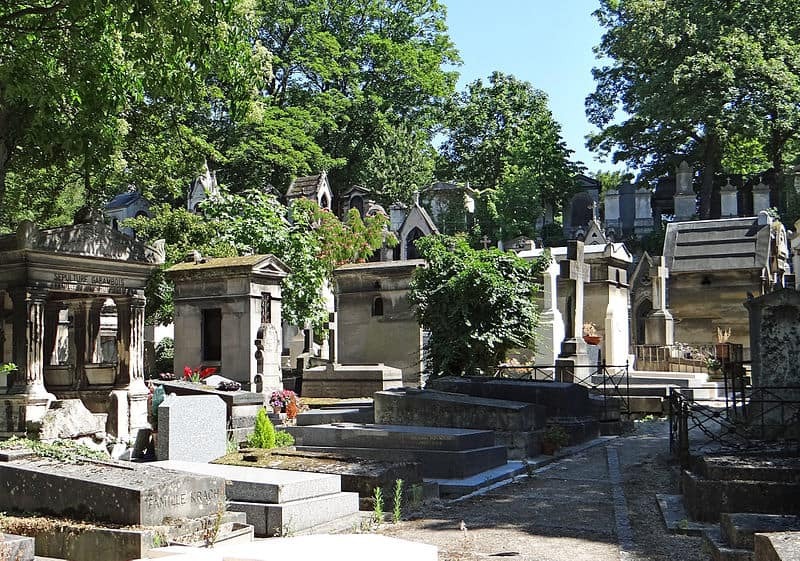 The Montmartre Cemetery, being the third biggest in the city, tends to steal the spotlight when it comes to picnicking with the deceased in this neighborhood. Not long ago while wandering the streets of Montmartre I accidentally came across a smaller and even more charming cemetery called St Vincent’s. It is situated by the Lamark metro stop and is easy to miss if you don’t keep an eye out for the iron gate that marks the entrance. There is almost never anyone in the cemetery and it is less crowded in terms of graves compared to the more well known necropolis’. This leaves ample space for people to set up camp and enjoy a few hours on the cemetery grounds while picnicking. Like Montmartre Cemetery, St Vincent’s is also a garden style site so there is lots of plant life and tree shade available to those who desire it. St Vincents’ is just a short walk down the hill if you’re leaving Sacre Coeur church at the very top. Stop here for your picnic either on the way to the church or on the way home! This little hideaway just south of the Sacre Coeur has become the hideaway for every individual or family that finds themselves overwhelmed with the crowds at the top of the hill. The park features a large, lush grass area with tree coverage and benches for those who are impartial to some ground time. The park and the church are separated by exactly 222 stairs. In the past I’ve enjoyed people watching from this park as friends challenge one another to a race either up or down. 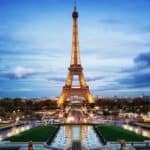 The best part about a picnic in Louise Michel Park is the panoramic view of Paris that you get to enjoy for the duration of your dining. Being so close to the top of the hill, the park boasts roughly the same view as the church does a few meters away. Its endlessly romantic and quite literally like picnicking on top of the world. Throw a coin in the foundation dedicated to the ocean gods for good luck! 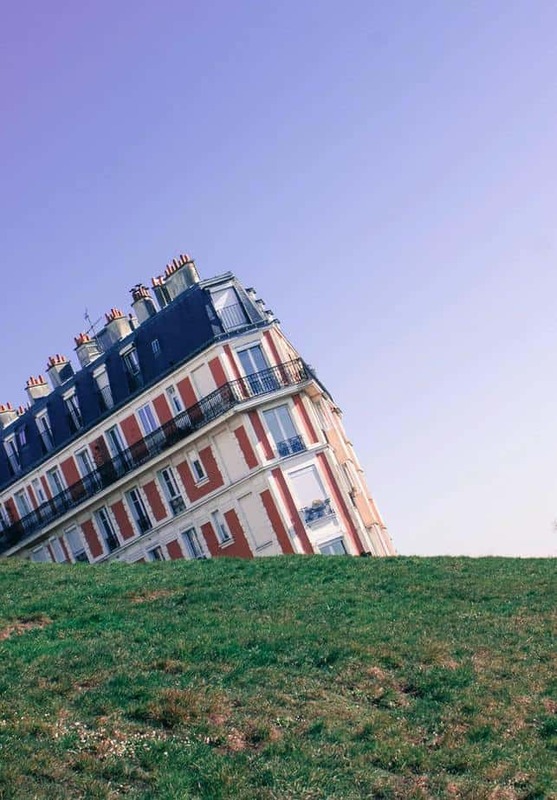 The sinking house is a wonderful trick of the eye that occurs only in the district of Montmartre. If you’ve only ever seen photos then its high time you get yourself to the exact spot where the said illusion takes place. Start at the front entrance of the Sacre Coeur. As you exit the church make your way down the stairs (mentioned as a possible picnic spot earlier in this piece). As you make your way down you’ll come to noice a very grassy hill directly to your left. Just behind the hill there should be an orange, mid-century building almost tucked away — that’s the sinking house! To get the sinking effect to kick in, lay on the lush grass and tilt either your head or camera until the hill appears to be flat (perfectly horizontal). Voila! The sinking house! Since you’re already on the ground you may as well stay and picnic on this grassy little hill. You’re welcome! Again, back up to the Sacre Coeur we go, but this time we’re exiting out the back not the front. The Parc de la Turlure is the hidden gem of a park tucked quietly behind the iconic landmark that is the church. Most people who visit the Sacre Coeur are so blown away by the front of the building they forget to mission to the back. Once in the park you’ll enjoy vast areas of grass and a range of plant life that seems to take over the space. The back of the beautiful church sticks out of the trees and instead of looking over the south of the city, as you normally would from this hill, you’ll have panoramic views of the south. Despite being so closely connected to the chaos of the main church, the park is predominantly quiet and there are many hidden nooks in which one can find picnic privacy. Montmartre may not be the most ideal district in which to picnic one’s days away what with everything being at a slight angle thanks to the hillside. That being said, if you know where to go and aren’t scared to get creative then Montmartre is picnic paradise!